Found out that it was because of NVIDIA's vBIOS encryption for pascal cards and the fact that Mobile Pascal TDP Tweaker is no longer being updated anymore (I think). Bump either way, if anyone knows whether or not I can do anything in this situation (would rather not buy a BIOS programmer if not necessary). That's because it's not an actual rom; there's still padding on that hdr file. Could extract it further, but since you're only interested in the embedded vbios you might as well extract the 1060M's oprom with MMTool. After that TDP Tweaker works fine (just tested it). Flashing the file is another thing. Iirc, direct flashing a vbios with nvflash will no longer work due to the new protection system. Maybe that isn't a problem with oproms though and the afuwin overrides will do the trick. 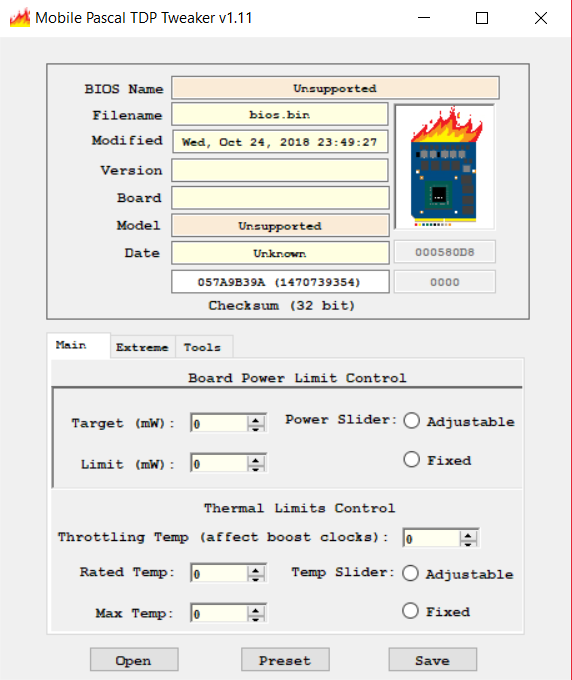 So start MMTool again and use the 'Oprom -> Replace' option to substitute your modified bios. The 1060M's device id is 1C20 (and vendor is 10DE).